"Within this volume there is something stimulating and thought-provoking for everyone. What an excellent volume to begin the new millennium!" "A rarity in edited books, I found no weak chapters. All were clearly written and well organized, and then provided excellent descriptions of that author's particular program of research….A strength of the book is the diversity of methodologies….Overall, this is an impressive, well-integrated book." 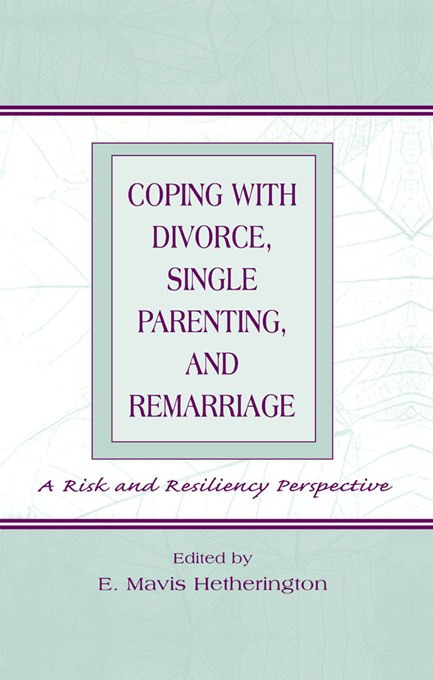 "…an important contribution to the existing library of books on divorce and remarriage because it seeks to identify and elucidate the key risk and protective factors explaining variability in individual adjustment following family transitions….provides a healthy mix of conceptual overviews and empirical findings that would be accessible to most readers. This…feature is a unique characteristic of books in this field." Contents: Introduction and Overview. Part I: Why Marriages Succeed or Fail. S. Carrére, J.M. Gottman, Predicting the Future of Marriages. T.L. Orbuch, J. Veroff, A.G. Hunter, Black Couples, White Couples: The Early Years of Marriage. Part II: Child Adjustment in Different Family Forms. K. Deater-Deckard, J. Dunn, Multiple Risks and Adjustments in Young Children Growing Up in Different Family Settings: A British Community Study of Stepparent, Single Mother, and Nondivorced Families. S. Avenevoli, F.M. Sessa, L. Steinberg, Family Structure, Parenting Practices, and Adolescent Adjustment: An Ecological Examination. Part III: Family Functioning and Child Adjustment in Divorced and Single-Parent Families. E.M. Hetherington, Should We Stay Together for the Sake of the Children? S.S. McLanahan, Father Absence and the Welfare of Children. P.R. Amato, Children of Divorced Parents as Young Adults. P.L. Chase-Lansdale, R.A. Gordon, R.L. Coley, L.S. Wakschlag, J. Brooks-Gunn, Young African-American Multigenerational Families in Poverty: The Contexts, Exchanges, and Processes of Their Lives. M.J. Zaslow, M.R. Dion, D.R. Morrison, N. Weinfield, J. Ogawa, P. Tabors, Protective Factors in the Development of Preschool-Age Children of Young Mothers Receiving Welfare. Part IV: Family Functioning and Child Adjustment in Repartnered Relationships and in Stepfamilies. D.S. DeGarmo, M.S. Forgatch, Contexts as Predictors of Changing Maternal Parenting Practices in Diverse Family Structures: A Social Interactional Perspective of Risk and Resilience. J.H. Bray, From Marriage to Remarriage and Beyond: Findings From the Developmental Issues in StepFamilies Research Project. M.A. Fine, M. Coleman, L.H. Ganong, A Social Constructionist Multi-Method Approach to Understanding the Stepparent Role. E.R. Anderson, S.M. Greene, E.M. Hetherington, W.G. Clingempeel, The Dynamics of Parental Remarriage: Adolescent, Parent, and Sibling Influences. Part V: Intervention. R.E. Emery, K.M. Kitzmann, M. Waldron, Psychological Interventions for Separated and Divorced Families.